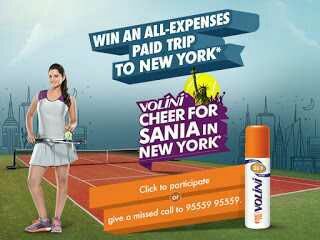 Participate in "Volini Cheer For Sania" Contest & Get a Chance to Win 100 Rs Paytm Cash! To avail this Offer From volini Simply Follow the below steps! Note : its on luck not everyone will get this copon. So try it if you want. • Give a missed call to 9555995559 you will get a message to write a slogan for the Volini contest. • You have to complete the following slogan - "For Sania, pain doesn't stand a chance because..."
• Send your slogan to 9555995559 and you will get a thank you message from them. • If your slogan is selected, you will get a message within 1-2 days with the Add Cash Coupon code. 2. Use the word 'pains' in your part of the slogan. 3. Make sure you add more than 10 words in your part of the slogan. 4. Be a little innovative. 7.Only one code can be added to an account.